How to import AVCHD MTS files to FCP 7 for editing on Mac, in this article, you will get the best tool to convert MTS files to Final Cut Pro 7 native video format, and then edit MTS with FCP 7 on Mac smoothly. FCP 7 is the ideal NLE for creative video editors, it has been released for several years. Though Apple released the FCP X, there are many users still prefer the FCP 7 editing software, they are familiar with the FCP 7 and may have installed some important plugins. After you have recorded some videos with your camera or camcorder, you may also have the need to import video files to FCP 7 for editing on Mac, for video formats like MP4 and MOV, you may import them to FCP 7 with no problems, but how about the MTS files? Nowadays many cameras and camcorders record videos in .mts format, such as Sony cameras, Panasonic cameras, JVC cameras, etc. on the camera related forums, there are a lot of users have encountered the MTS to FCP 7 importing and editing problems. As the problem showed above, there are many users have problems when they want to import MTS to FCP 7 for editing on Mac. The main reason that caused the problems is because the MTS video format is not compatible with FCP 7, FCP 7 only accept limited video formats, such as MP4, MOV, etc. so in order to edit MTS with FCP 7, you have to convert MTS video to FCP 7 supported video format. From Apple FCP official pages you will get the info that FCP X/7 supported native codec is Apple ProRes codec, with Apple ProRes codec MOV format, you can edit MTS video in FCP 7 smoothly, and you won’t have any importing or editing problems. To convert MTS to FCP 7 supported video format, you will need a MTS to Apple ProRes converter, here we recommend the Acrok MTS Converter for Mac program for you. Acrok MTS Converter is the top HD video converter on the market, which can convert MTS, M2TS, MXF, MOV, MKV, AVI, etc. HD files to any formats you need, such as convert AVCHD to FCP X Apple ProRes 422 codec, convert MTS to DNxHD codec, MP4, MOV, AVI, etc. 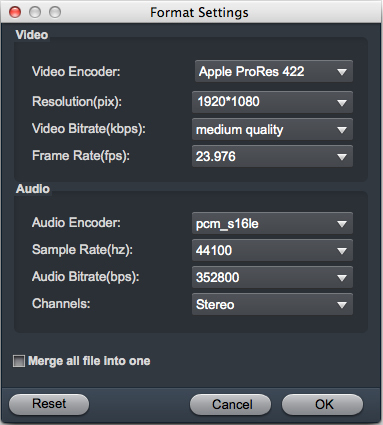 How to convert MTS to FCP 7 Apple ProRes codec MOV format? Now you can follow the steps below to use Acrok MTS Converter for Mac software to transcode MTS to FCP 7 native supported Apple ProRes codec MOV format, and then you can edit video files with FCP 7 smoothly. 1. Install this MTS to FCP 7 converter on your Mac. This program also has Windows version, so if you need to convert MTS video on Windows computer, please download its Windows version. 2. Run this MTS to FCP 7 converter, and import your video files into it. You can add several files at one time. 3. Choose Apple ProRes codec MOV format as output format, this format is best for FCP 7 and FCP X. if you also need other formats, just choose according to your need. 4. Click settings button to adjust the output parameters, such as resolution, bitrate, frame rate, etc. this step can be skipped. 5. Click convert button to start the MTS to FCP 7 Apple ProRes conversion. This MTS to FCP 7 converter will begin the conversion immediately, when the conversion process finished, you can load converted files to FCP 7 and edit natively. Just take a try now, hope this FCP 7 MTS Converter can help you.